You may have noticed fringe trim on all sorts of wardrobe items this season. A lot of it is a nod to the ‘70s boho trend, but some of it has been inspired by fashion from the 1920s (Flapper Chic). Either way, the vibe is Retro and I like that aspect of it best. ‘70s boho fringe tends to look very casual whereas 1920s fringe is dressy and glam. Something for everyone. The examples below illustrate both vibes quite well. Sporting fringe through footwear or as an accessory like a bag or scarf is the easiest and most subtle way to incorporate it into outfits. So if you like the idea of fringe but don’t want to commit to fringed clothing — choose a shoe or accessory with fringe trim. Note that you do NOT need to combine fringed footwear, bag, scarf or jewellery with a boho support act. Remix these pieces into any style for a very 2015 look. Fringed clothing pieces like knitwear, jackets, coats, vests, blouses and ponchos are an acquired taste. They usually make a bolder statement than fringed footwear and accessories, so consider yourself warned. I like boho fringed pieces best when they are remixed with a bit of hard edge like black leather pants, or with a Sporty Luxe support act, because it creates an interesting modern juxtaposition. This is my favourite type of fringe because it’s dressy, refined and retro. Glam fringed dresses are the most common, but fringed jackets and skirts are coming through too. Dressy fringed tops and jackets are great paired with jeans and dressy shoes. Or pair them with a trendy pair of black trousers for the holidays. Although fringe is making a fashion statement right now, its retro quality transcends fashion trends and gives it a high longevity factor. Fringe trim works well incorporated into non-boho outfits, which makes it quite versatile. After all, the Chanel jacket has fringe trim! How do you feel about fringe? Not sure if this counts but I adore eyelash fringe on lace. The joie elvia black lace top, the DVF zarita long dress in black are two of my favorite pieces. I also like fringe ocassionally on scarves but it depends on the piece – I have a dramatic velvet burnout fringed wrap which is fab for black tie or very dressy events. Lastly, just ordered the 350 maree black cashmere poncho (coming today) after seeing Una in her skull poncho. 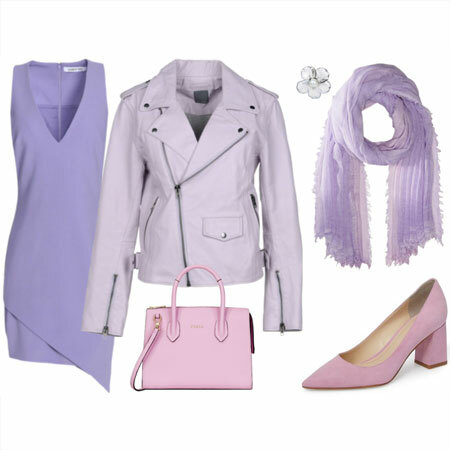 I would style that with my black leather leggings if it works out. I like the look of these pieces but I’ve seen many fringe pieces last not too long after moderate use. In that regard, I think I’ll pass. But it is really interesting to see how it meshes with today’s fashion. I have a hard time with this one and don’t know why! I love how it adds movement, though. I adore fringe. I love the boho fringe look and I love the flapper fringe look. I’not really a fringe girl, but did shop the trend this season. I have a fringed on it’s low hem maxi cascade knitted vest, and 2 pom-poms on the edges of my asymmetric pocho, if that counts:-). I’m not a big fringe fan, but I do like the 20’s inspired fringed hem dresses very much. I have one item with fringe. I purchased a red plaid fringed scarf this year and wore it once. I really liked it and may want to look into some more subtle options. I can see the qualities of the ’70s boho inspired and the ’20s glam inspired, is there also sometimes a veer towards western? Fringe is unlikely to make its way into my current wardrobe, though I enjoy seeing it on others, especially the more elegant looks. My birth year gave me a jump start on wearing pieces with more boho roots.and for practical and aesthetic reasons, they haven’t beckoned this time round. I have had a ridiculous amount of fun carrying a very fringe-y Sam Edelman handbag in cream that you featured earlier this year. It’s like carrying a muppet! People stop to compliment me on it all the time. Not sure if I care for fringe on my clothing, but it sure is fun to carry! 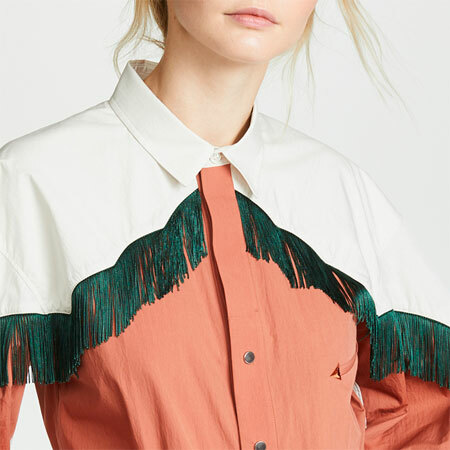 I do not have any fringed items but I bought an embroidered blouse that ties up with tassels, so this is my slight nod to this trend. I think fringe is fun and I’ve seen so many wear it very well. While I do like a touch of boho and and love the 70’s inspired looks, fringe is just not for me. Although I do have a few scarves that have a fringe hem. However, I really like the 20’s glam version and could see myself wearing a cocktail dress with sparkly fringe. And yes, a Chanel jacket with its scaled down fringe too. I love the look of flapper fringe especially, but me and fringe are a dangerous combination. I like tiny touches of 20s dressy fringe. But not the boho type, or only very rarely. I love the way it adds movement, but in the casual iterations it is just too casual for me. I CAN see carrying a bag with fringe, though, or some other accessory. Having said that, I snip the fringe from almost all my scarves. I like the 20’s version of fringe, and have a very simple and pretty J Crew top with a fringe hem that fits this bill. I’m not really into the boho suede fringe look though – it reads a little too western for my taste, but I’m intrigued with your idea to pair it with something sporty or something leather to take out the boho/cowboy feel. Just last night I saw a gorgeous Mackage blanket wool shawl/scarf with a leather fringe trim worn over a coat (in a magazine) – and I was totally captivated. It would be great, as you suggest, over a leather bottom too. I do have lots of fringe in jewellery – the fringe being a fine chain – but that looks more rock-n-roll than boho Earrings, bracelets, necklaces …..
I’ve never been a huge fan, but I don’t mind a touch of it here and there. I like it on the poncho I bought, and I toyed with the idea of that fringed clutch. But flapper styles look awful on me — all those dropped waists. And I like a touch of boho, but the fringe would need to be just right and not too costumey. I do wonder if it might look dated quickly since its trending so hard and fast right now. I have my Sam Edelman Louie boots in 3 colors, and I’m set. Glad to be on trend! Lots of fringe feels messy and fussy for me. I enjoy this look on others. I like the look of fringe, particularly the 20s type, but it’s too impractical for me as I am a huge klutz! I can already envision myself getting stuck in car doors and tangling with shrubbery…. Just what I was going to say, Diana. I tend to step on or drag my fringe through something. I have fringed hidden wedge heel booties (impulse sale buy) with fringe around the top and a poncho top with fringe around the bottom. And that’s all I need with fringe. I love this look! I have a black fringe booties and a pair of camel fringe booties. I have a bag with a small fringe detail and I have a leather vest under my radar, but I’m waiting for the sales after christmas as it’s more expensive. Angie, do you think this trend will continue for 2016? 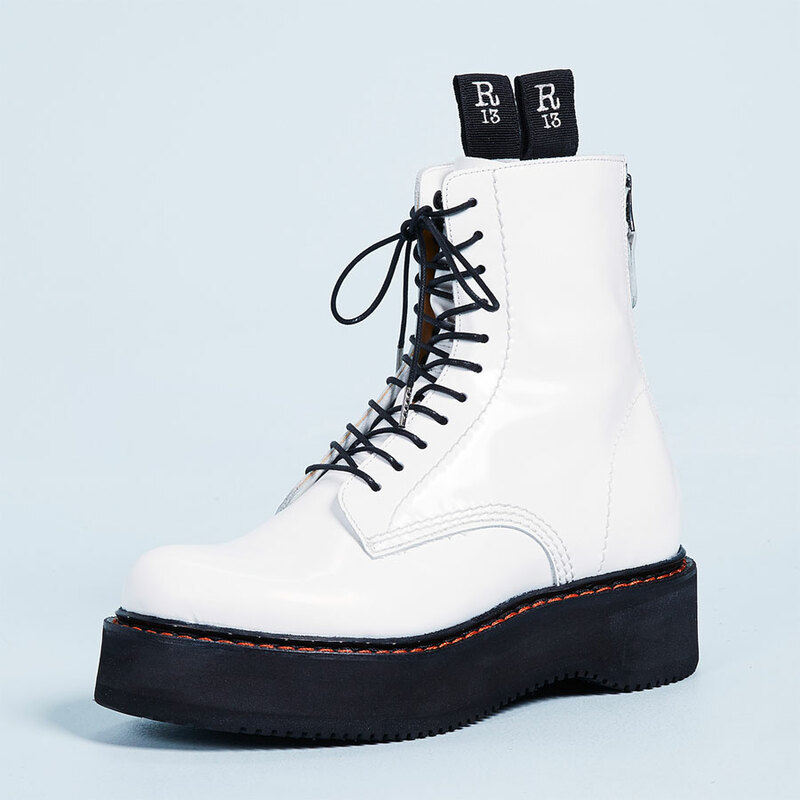 I embraced this trend with two pairs of ankle boots and am loving it. I like wearing fring on ponchos too. My question every time this trend comes around is how long will it last? Hah…I just got a fringed purse yesterday. It is a fun addition to many items! But sometimes it does get in the way !!! I had my eye on that Patricia Nash crossbody bag during NAS. It comes in two of my favorite colors! I ordered an open front poncho from Boden with fringe. I ordered it over a month ago. I hope to receive it soon so I can wear it before winter really sets in. The extent of fringe for me this time around is the tassel on my new fall bag. But if something catches my eye I might go for it. "Although fringe is making a fashion statement right now, its retro quality transcends fashion trends and gives it a high longevity factor. Fringe trim works well incorporated into non-boho outfits, which makes it quite versatile. After all, the Chanel jacket has fringe trim!" Fringe can be very fussy – I hear you Skylurker – but as some of you mentioned – it has great movement. I am partial to a fringe bag, and like '20s fringe. I’ve surprised myself by really craving a cognac, fringed bag. I’ve had my eye on a Frye one on the Nordie’s site but I’m not sure if I want to spend that much on something I might get tired of. I’m going to look closer at your selections. So far I have just boots and bags with fringe, but I wouldn’t rule out other items. 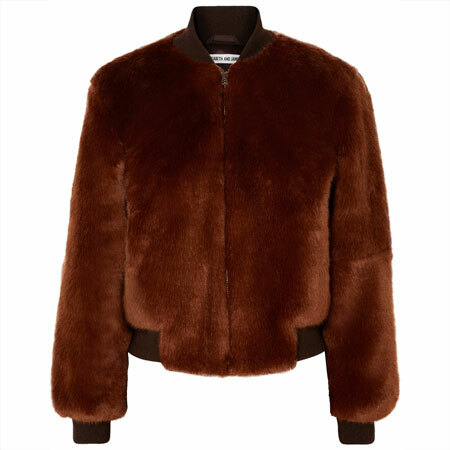 Like that Milly jacket from Saks…. Fringe is a little fussy for me, but it’s fun to see all the ways it’s being incorporated into fashion right now. I’m wearing a black, Nic and Zoe fringed skirt today! I love it! As I don’t personally care for “patterns” in fashion, I like to use details to add visual interest, and fringe fits that to a T.. I have added a black skirt with long fringe along the hem, two hobo bags with a nice fringe zipper pull, and a sweet necklace with a fine gold fringe detail to my wardrobe so far this fall. I guess I am a fringe fan – I have two ponchos, one sweater, and a vest with fringe, all purchased in the last year. I love when things I like are suddenly fashionable and available so I can stock up. Despite having “boho” in my fashion descriptor, I’m more attracted to the the 20s fringe than the 70s version. Of course, the thing that caught my eye first was the $3000 Brunello Cucinelli necklace. Of course. I’m not super into the ’70s fringe because I remember it all too well from the first time around. But I LOVE the 20s version! And also, what’s not to love about the Chanel-style fringe trim? That Vince jacket is killing me!! No fringe for me although I can appreciate the look on others. Like skylurker I would be fighting the urge to untangle and align them, plus I have a very playful cat. Fringe would be irresistible to her. I shocked myself by falling in love with that cognac Frye fringe hobo bag that AviaMariah mentioned. When DD found it NWT on ebay for about 40% off, I pounced and called it my birthday present. I adore wearing it. At first I only wore it on weekends but now I’ve worn it twice to work where it’s been received very well! Fringe is, well…fun, and similar to Laura, I have a brown suede bag with long fringe by Ralph Lauren that I enjoy using in the autumn and, in fact, I’m using it this week. Its long pieces flounce about and move around making it a unique accessory that brings a smile. Seeing fringe really tickles me–I love looking at a lot of these styles, even if I might not see myself wearing them. I do like the sound of Dana’s and Dakotacheryl’s black skirts with fringe–that would be a fun way to wear this trend. Along those lines, I really like the Banana Republic black dress with fringe hem. And Chanel-style jackets with fringe have long appealed to me. And like you, Angie, I really like fringed bags and may find or make a clutch for myself. Fringe is fun! For me it has more of a boho/hippy connotation than western, even the suede items. Which is what I got- a smallish gray suede shoulder bag with fringe. 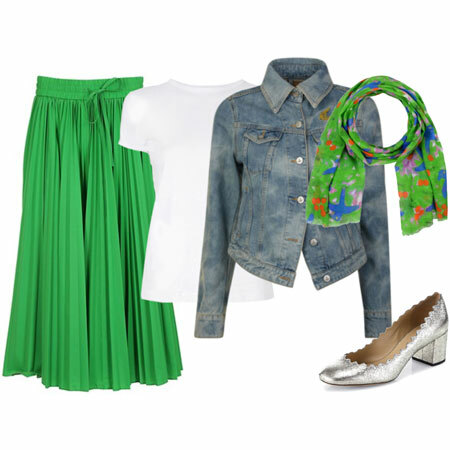 I like it for a fun weekend look with jeans and boots. and the size and light weight make it a practical choice too. And today I am wearing a silver fringe pendant necklace. I really like some of the glam pieces you’ve shown and would be open to adding something fringed to my wardrobe. Oh, fringe with sporty luxe is brilliant. So you don’t look like you’re still dressed for Halloween (!) Also: 20’s fringe – sophisticated and pretty. I’m not feeling the boho right now. I find it too distracting to wear on clothing (I’m always checking for tangles), but I have a Gili bag with a long fringed tassel that I just love, and it seems to be tangle-proof. On a trip to Fort Clatsop (near Astoria, OR) many years ago, we were delighted to learn that fringe was used on the leather garments worn by Native Americans and Lewis and Clark’s expedition team in order to wick the rain away from their bodies. That’s is interesting fact about the Native Americans. I like a little fringe myself, makes me happy. Not sure if I’m the fringe type but I’m certainly interested in trying it out with the Fringe Collar sweater coat from Banana. I added a lovely little fringed bag to my collection this summer. I also have a few fringed scarves. Love the movement! And i would totally go for a fringed skirt…if I was a skirt wearing kind of gal :-)! I fell in love with the fringe clothing items that Sean Kelly designed in the 13th season on Project Runway (I think he won that season – not sure.) Heidi Klum wore one of his designs (a beautiful electric blue floor-length fringe gown) to a premiere and it was a show-stopper! Absolutely gorgeous. Since then, I have kept my eyes out for a fringed piece of clothing – and until this season, the pickings were slim. Now, however – fringe is everywhere – but I still haven’t found my special piece – other than a black fringed handbag that I’ve had in heavy rotation for the past year – and a burgandy – raspberry Zara suede fringed clutch that I just purchased a couple of weeks ago. LOTS of fun! I generally like boho but I’m not loving the fringe. I feel like it is a little too trendy and won’t be around for long. I do love the 20s fringe pieces. Love fringe, especially paired with softer pieces. I hope to be able to make some up this season. I wanted to add just a touch of fringe so bought a tassel pendant necklace and am still trying to decide if I like a fringed clutch/crossbody bag from Target. I have some scarves with fringed edges but will leave it at that. I am also afraid that this may be a passing trend although I can see fine retro fringed garments like leather jackets always being stylish. I don’t mind little touches of fringe here and there. I think I perhaps prefer the glamorous 20’s iterations to the 70’s boho as I don’t really have any boho in my style. I am tempted with some of the fringe jewellery and I love the fringe clutches. I am RATE so the messiness does not bother me. I have not added any yet but maybe? Big fan of fringe, both the 70s styles and the 20s styles. I have a few fringed items, mainly fringes on scarves. But I do have a fringed clutch (the gray version of the burgundy Zara clutch was a fave this past summer! ), a navy sweater with fringe detail (the one I wore to the meetup Saturday), a cropped eyelash sweater, and some hopeful ponchos which are on the way. Been looking for some fringed summer shoes/sandals the past two summers but haven’t found the right pair yet. I have zero things with 20s style fringe but have been finding it quite appealing this season. That black and white fringed BR sweater caught my eye earlier this season too, still mulling on that one.